Fujitsu has issued a recall for battery packs used with their notebook computers due to fire hazards. Teen’s cell phone catches fire. PC Pitstop/D2 Worldwide Research cited in the national media for the 2nd time this month. 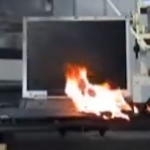 Nationally syndicated show America Now recently featured footage from PC Pitstop’s Exploding Laptop research video.